After a brief period with Ford Larry Wood started at Mattel in the late 1960s and became one of the first designers for Hot Wheels, debuting with the Tri-Baby in 1970. He would go on to some of the most iconic Hot Wheels cars, including the '49 Merc, the Boyd Coddington collector set, and the Ramblin' Wrecker (which originally featured Wood's phone number on its sides). 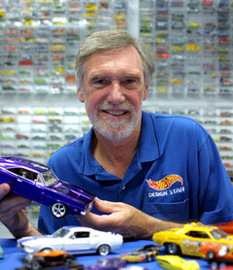 He has been with Mattel/Hot Wheels team since 1969. He continues to work as a consultant for the company.